I’m a little nervous, to tell you this story about my childhood, and how we celebrated Christmas in my family growing up. First off, I don’t want to offend anyone who doesn’t celebrate Christmas. Secondly, I’m calling into question the long standing Christmas tradition of telling kids about Santa, especially the part about “if you aren’t good, Santa won’t bring you any gifts”. You might disagree with me. And that’s okay! I have faith and trust in you to respectfully disagree. So, thanks, in advance for being a safe space! And thanks for reading. When I was two years old my parents told me that Santa Claus didn’t exist. Most people I tell this to, let out a long sighing, “Ohhhh!” as if I just told them that my dog died. Yet growing up while knowing the truth about Santa didn’t destroy the magic of Christmas. And we did the same thing with our own kids when they were young. The “you be good this year otherwise Santa won’t give you any gifts” aspect of Christmas is a little problematic for parents, like you and me, who choose to raise their kids knowing that they are loved unconditionally. But the my discomfort with Santa doesn’t end there. Nicholas, an early Christian, secretly gave money three separate times for three sisters whose father didn’t have enough money for a dowry for them to get married. During the night he snuck the money into their stockings. But one night the father caught St. Nicholas, Nick asked for him to keep his secret. St. Nick gave to this family unconditionally because of his love for God. “You’d better watch out, you’d better not cry, you’d better not pout I’m telling you why. . . He sees you when you’re sleeping, he knows when you’re awake, he knows if you’ve been bad or good so be good for goodness sake . .” Those lyrics are just creepy! I think that kids need to have privacy, space away from adults, freedom to fully express their feelings. No matter what our children do, our love for them will never diminish. I don’t like all the things my child does, but I always love her, for everything she is and everything she isn’t. In that loving space, I find ways to teach her to be more of who she is meant to be. When our kids act kindly out of the goodness in their hearts, not because of threats or bribes, it is naturally reinforcing. Kids that get rewarded for doing something experience less enjoyment, and are less motivated to do that behavior again! Kids trust us fully and need us to help them make sense of the world. They rely on us to be truthful. They rely on us for security and safety. I know kids who have gotten angry with their parents after hearing that “Santa isn’t real”. I also know kids who are frightened by Santa. I know a little girl who was so scared that a strange person was coming into their house in the middle of the night that she wouldn’t go to sleep on Christmas eve, finally her parents convinced her that it was actually a Christmas bunny who would deliver the gifts (a lie on top of a lie). Christmas is about giving, not receiving, right? A problem occurs when parents use gifts as a reward for “good behavior”; it distracts kids from their focus on giving. If gifts are conditionally given, kids focus on themselves. If gifts are given unconditionally, kids can focus on others, giving unconditionally to them as well. The fun of Santa is playing the “Santa game”: writing a letter to Santa, leaving out cookies and milk, having the gifts appear magically overnight! You can still play the “Santa game” (I did and I still do!) and have all the magic of Christmas without lying to your kids. Kids can handle the duality of knowing that Santa is/isn’t real all at the same time. They will still believe in magic! You won’t be taking anything away from them. Now I’m curious about you. 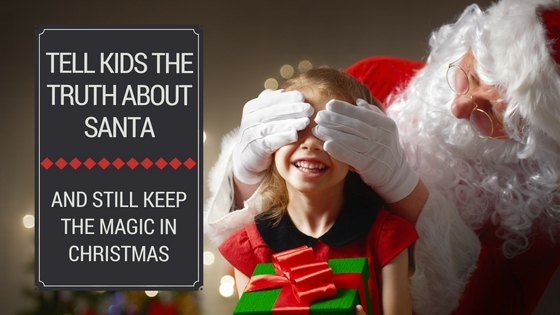 Tell me in the comments section… How have you handled telling/not telling your kids about Santa? How do you preserve the magic of Christmas?